Mr. Reynaldo A. Donghit, Jr. R.N. Failure to report observations to attending physicians. Failure to exercise the degree of diligence which the circumstances of the particular case demands. Wrong medicine, wrong concentration, wrong route, wrong dose. Defects in equipments that may result in injuring the patients. Errors due to family assistance. Administration of medicine without a doctor prescription. Three conditions are required to establish a defendant’s negligence without proving specific conduct. That the injury was of such nature that it would not normally occur unless there was a negligent act on the part of someone. That the plaintiff himself did not engage in any manner that would tend to bring about the injury. also denotes stepping beyond one’s authority with serious consequences. It means an irresistible force, one that is unforeseen or inevitable. is the lack of ability, legal qualifications or fitness to discharge the required duty. Although a nurse is registered, if in the performance of her duty she manifests incompetency, there is ground for revocation or suspension of her certificates of registration. Nursing aides perform selected nursing activities under the direct supervision of nurses. Nurses should not delegate their functions to nursing aides since the Philippine Nursing Act specifies the scope of nursing practice of professional nurses. If a nurse delegates, he is responsible. Under the Philippine Nursing Act of 2002, nursing students do not perform professional nursing duties. They are to be supervised by their Clinical Instructors. 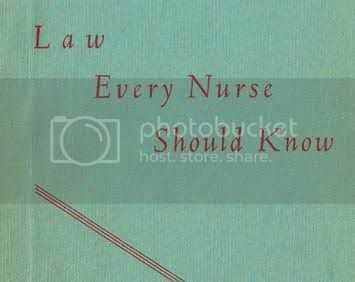 A nurse cannot bring suit against the patient if she gets hurt or contacts the disease since upon accepting the case, the nurse agreed to assume the risk of harm or infection. It is the NURSE who actually secures the consent of the patient upon admission. The prognosis, if the recommended care, procedure, is refused. A signed special consent is necessary before any medical or surgical treatment is don such as x-rays etc. If he is incompetent (minors or mentally ill) or physically unable, consent must be taken from another who is authorized to give it in his behalf. If emancipated minor consent is signed by them. They cannot legally give consent. Parents or guardians. When an emergency situation exists, no consent is necessary because inaction at such time may cause greater injury. Patients other than those who are incompetent to give consent can refuse consent. Is the termination of the ability to produce offspring. The husband and wife must consent to the procedure if the operation is primarily to accomplish sterilization. If its medically necessary or an incidental result, the patient alone is sufficient. It serves as a legal protection for the hospital, doctor, and nurse by reflecting the disease or condition of patient and its management. Nurses have the responsibility of keeping the patient’s right to confidentiality. Permission has to be taken from the Medical Records Division of the Hospital. is a legal wrong, committed against a person or property, independent of a contract which renders the person who commits it liable for damages in a civil action. Battery is an intentional, unconsented touching of another person. Invasion of Right to Privacy and Breach of Confidentiality. Slander is oral defamation of a person by speaking unprivileged or false words by which his reputation is damaged. Libel is defamation by written words, cartoons or such representations that cause a person to be avoided, ridiculed or held in contempt or tend to injure him in his work.